Book by Sept. 15th for the Early Bird Special! Contact me. I know, I know. . . summer isn’t over yet! Although, here in Valdez, new snow on the mountaintops greeted us yesterday morning. All the more reason I’ve started daydreaming of colorful hammocks beneath swaying Palm Trees, sipping from coconuts, kayaking in flip flops and a bathing suit, and practicing some nourishing yoga! Not a kayaker? No problem. Been meaning to start doing yoga but wouldn’t know downward-facing dog from warrior pose? No worries. Never left your hometown? Think nothing of it! Newbies and those who are more experienced will find that this trip was created with everyone in mind. After all, there was a time when I sat down in a kayak for the very first time (now I’ve been guiding for 6 years) and did my first downward-facing dog. I will be joined by founder of Yoga Currents, long-time yoga instructor and seasoned kayak guide, Leigh Lubin. We’re here to ensure that everyone who joins us has a spectacular and unforgettable time. It’s time to plan your winter holiday in paradise. What could be better than treating yourself to a nourishing, sunny, tropical get-away? Click here for more info and a detailed trip itinerary. Why yoga and sea kayaking in Panama together? It’s a match made in tropical heaven. . . they’re perfect for each other. A beautiful retreat on the Pacific side offers tranquility and beauty, an ideal setting to sink in and reap the benefits of a yoga practice. Then we’ll travel to the Caribbean coast, where the San Blas Islands (called Guna Yala) offers us the perfect location for sea kayaking and beach yoga, as this tropical archipelago is comprised of hundreds of palm tree-dotted islands. I’ve been practicing yoga on my own (my active lifestyle of moving every 5 months hasn’t quite allowed for much time in a yoga studio) for only a few years. Like many people, it took me a couple of years to begin to scratch the surface of all of the amazing benefits of yoga, from the physical to the sometimes more subtle emotional and mental ones. Yoga isn’t only something that I love because it feels amazing, but I consider it an important part of my life as a professional kayak guide, a job that is extremely physically demanding. And now that I’ve entered my 30’s it’s become even more important to grow my yoga practice (what I mean is, I ain’t gettin’ any younger!). I spend about half of each year sitting in a kayak, paddling for hours and hours, loading and unloading hundreds of pounds of gear into boats on camping trips, carrying these heavy kayaks and gear up and down docks and beaches, and bending over a lot to assist my guests getting in and out of their kayaks. But I absolutely love what I do and I want to be able to go kayaking when I’m a little old lady, like Ernestina (below left), who thoroughly enjoyed her first time in a kayak! Also noteworthy is the group of 11 women ages 55-75 (right photo), who joined me in the Caribbean for a paddling adventure earlier in 2017. You can bet some of those ladies practice yoga! Even if a busy day allows for just 10 minutes of stretching, this will have a positive impact on how my body fares as a guide. You’ll be amazed at how good it will make you feel too. It’s important to awaken and enliven the muscles each day, as well as strengthen and lengthen them. I feel stronger and more flexible now than I did as a 20-year old, before I started doing yoga. How did I get so lucky again? Yoga can make the difference between feeling fluid, alive, healthy, connected, and having fun or not. On this retreat we’ll create space in the hips so it’s easier to stay upright in your boat. Tap into your support instead of fighting it! We will strengthen the core and stimulate innate energetic pathways that move supportive energy upwards to sustain you from the inside. We’ll learn to internally float over our pelvis, riding our own inner waves and wind, as we increase shoulder mobility and strength. By the time you get to your kayak you’ll feel stable, fluid, grounded, engaged, and playful. We’ll take those feelings to sea. During the sea kayaking portion, you’ll enjoy playful white sand beach yoga sessions to stay supple and strong throughout the trip. Yoga and sea kayaking are the perfect opportunities to sink in, revitalize, discover, and connect to yourself and the wonders of the sea! Tropical fish, here I come! We’ll also be eating fresh, healthy food on this trip, as well as doing other fun activities, such as standup paddling, snorkeling, hanging with the Guna (the indigenous group who live on the Caribbean islands who I’ve worked with for the past 4 years and who we’ll be visiting), exploring the scenic Casco Viejo (“Old Town”) on the waterfront in Panama City, and visiting the famous Panama Canal. All of these are included in the trip. See you in Panama! The iconic Columbia Glacier, which started a catastrophic retreat in the early 1980’s when it broke free from its’ terminal moraine, (a deposit of land debris -rocks, gravel, sand, clay, boulders- left over from a glacier) is currently about 14 miles further back in the bay from the moraine. For most people that I take sea kayaking in Columbia Bay, they are paddling around icebergs that are grounded on the moraine that were under the glacier in their lifetimes! That always gives them something fascinating to ponder. For most people on this planet, however, their relationship with ice goes no further than what they slip on shuffling to their car in the cold winter months, or what gets plopped into their cocktail glasses at the bar, or lemonade glasses (if they’re under 21, of course). Or maybe they’ve skated across a frozen lake (for all you northerners or Canadians), or sang along to the songs in Frozen (although, I prefer Happy Feet). Or maybe it’s only on a computer screen or spread across the pages of a glossy National Geographic magazine, where they’ve witnessed the myriad blue patterns on icebergs. I, however, am fortunate enough to return to Columbia Bay, as well as other glaciers in and around Valdez, on a daily basis. This allows me plenty of time to reflect on my own experiences in the wonderful world of ice. And for anyone who has paddled with me, I make it quite evident how much I LOVE ice. On more than a few occasions I have been hurried along by my own clients to stop photographing icebergs so we can continue our paddle:) Visit my “Iceberg Gallery” to get a further glimpse of my love for this beautiful, freezing substance. Check out this video from my YouTube Channel of kayaking in Columbia Bay. Just like life, people pretty quickly pick up on the fact that the ice is constantly changing, never appearing the same for more than a brief moment. That’s why I love paddling around so much. It’s a constant reminder that life is in a state of constant change. And that’s a beautiful thing. You can sit and watch an iceberg melt right in front of your eyes, morphing shape, color and size. You can fill your water bottle underneath a waterfall cascading down from an iceberg. You can hear the popping, sizzling, groaning, and hissing as air releases from air pockets in the ice. It’s an experience not to be missed in this lifetime. Well, enough about my love for ice. Here’s a wild idea: come to Alaska and allow me the pleasure of paddling with you around ice, so that you may experience for yourself the wonderful world of frozen water! These people certainly loved it. The Sea Otters and Harbor Seals love it too. As always, thanks for reading. I’ve just returned from a 3-day Shoup Glacier to Sawmill Bay trip and have a Glacier Island to Columbia Glacier 4-day trip coming up, so stayed tuned for a post about these. Photo is so nice, I had to use it twice. Cheers! For five days in a row I awoke to the sound of two Brits giggling in their tent. That’s right. . . giggling like school children! (I don’t think they’d mind me saying so.) As I lit the stove to boil water for coffee, gazing out over the ice-filled bay in front of Columbia Glacier, I thought giddily to myself, “somewhere along the line I must’ve made a really good decision if this is what I do for my life’s work”! I get to share with wonderful people the most beautiful places in the world using my favorite mode of transportation, sea kayaks. This trip, a five-day kayak and camping expedition starting on the south side of Glacier Island and finishing off with three amazing days exploring the recently-revealed landscape at the face of Columbia Glacier, was one of the best yet! A huge thank you and enthusiastic cheers goes out to my two clients, Rob and Anya, who just happened to squeeze in this kayak adventure amidst their lengthy motorcycle tour starting in Washington. Umm, yea. . . they’re kind of badasses on two wheels. Now they can proudly say they’re badasses with double-bladed paddles. This is Alaska. . . coastal Alaska, so there’s no shame in saying that we experienced some pretty wet and cold conditions, however this was supplemented with sporadic sightings of what we called the strange yellow orb in the sky. No harm done though, as we equipped and dressed ourselves for the occasion. Anya made some important discoveries that wearing two pairs of wet weather gear is considered a norm. Well, why wouldn’t you wear two pairs of rain pants and two rain jackets? And this is where the impressive amount of giggling came into play. Rob and Anya maintained lively spirits, adventurous attitudes, and senses of humor that would have anyone laughing up a storm in any weather conditions. Yellow orb in the sky or not, the three of us had a blast! Interestingly, both Rob and Anya were reading accounts of polar expeditions, and even though we might have been in cold and damp conditions, their daily updates of expedition parties having to winter in Polar pack ice, put into perspective how plush we had it. After all, we didn’t have to worry about getting scurvy or having to kill marine mammals to eat. In fact, Anya often commented on my seemingly bottomless “Mary Poppins-esque food bags”, from which I pulled out many a fresh vegetable and Prince William Sound delicacies, such as Sockeye Salmon fillets and Cod. We even ran into such good fortune (literally we ran into my friend’s boat as he was chucking shrimp heads into the water) as to receive the delicious gift of fresh Prawns. Now that was a sweet treat! Doesn’t get much fresher than this! Along with spending time in the kitchen tent stuffing our faces with my delicious homemade meals, and getting warm and dry, we enjoyed many of the things that make a sea kayak expedition in Prince William Sound such a special and unique experience. We delighted in many wildlife sightings, such as a dozen Mountain Goats that we watched from our kayaks in Columbia Bay. We paddled past the Sea Lion haul-out on Glacier Island to enjoy these gregarious creatures, as well as saw lots of Tufted and Horned Puffins flying in and out of the sea caves that they nest in. Unfortunately, I couldn’t snap a photo of the flying birds. And, of course, we saw quite a few Harbor Seals and the adorable Sea Otter. The grand finale, the show piece, the main exhibit, the pièce de résistance (you get the idea). . . Paddling through ice to land at a very recently-exposed beach (i.e. one year, as the glacier has retreated back up onto land in this area) between two branches of Columbia Glacier to scramble up rocks like Mountain Goats to set foot on the glacier and glimpse a view of the impressively expansive ice field. Run-on sentence? You betcha. Incredible experience that not many people have had nor will have (unless, of course, you book this trip with me)? Absolutely. This was actually my first time exploring this new terrain along with Rob and Anya, which made the excitement level exceptionally high. I’ve been known to get pretty giddy when I’m seeing something for the first time out there. That view from the top! Yes, that’s right, we luxuriated in Columbia Glacial Facials. Now, as prefaced, I must share with you my second all-time favorite iceberg that I’ve ever encountered. Want to see my number one? I bet you do. Just look at it. My number one. We happened upon this beautiful piece of ice on the return paddle from the glacier face to camp. Rob and Anya had to pretty much pull me away from this beautiful iceberg. The only way we could think to celebrate such an exciting day at the face of the largest tidewater glacier in Prince William Sound. . . Bust out the emergency tequila! Our fifth and final day, we paddled back down Columbia Bay, enjoying more ice and a waterfall. I will never tire of paddling around ice. Thank you so much for reading. Check out my other blogs about exciting trips in both Alaska and Panama. Stay tuned for the next post. I will be paying homage to the beautiful and mesmerizing ice that I am fortunate enough to see and paddle around day after day. This is my way to commemorate the gigantic iceberg that recently broke free from the Larsen C ice shelf on the Antarctic Peninsula. 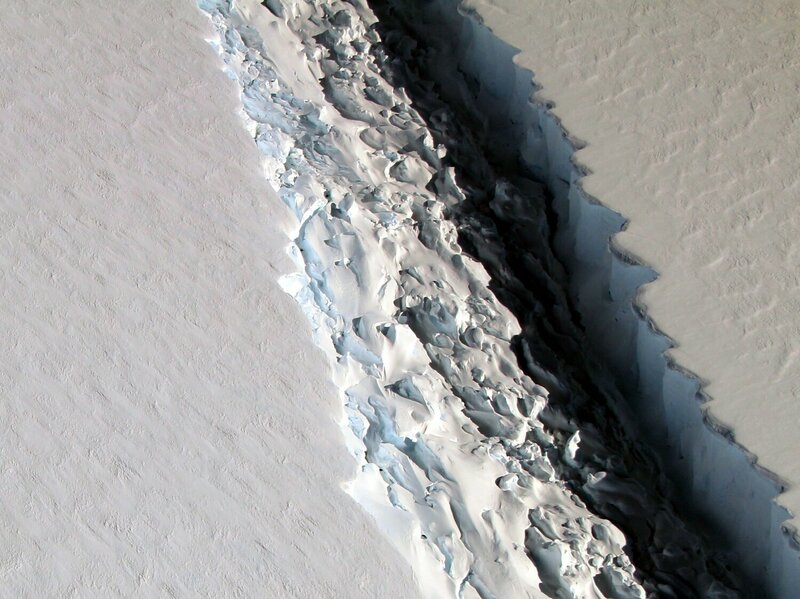 Read more about this massive iceberg from NPR and NASA. And check out the video from The Guardian. 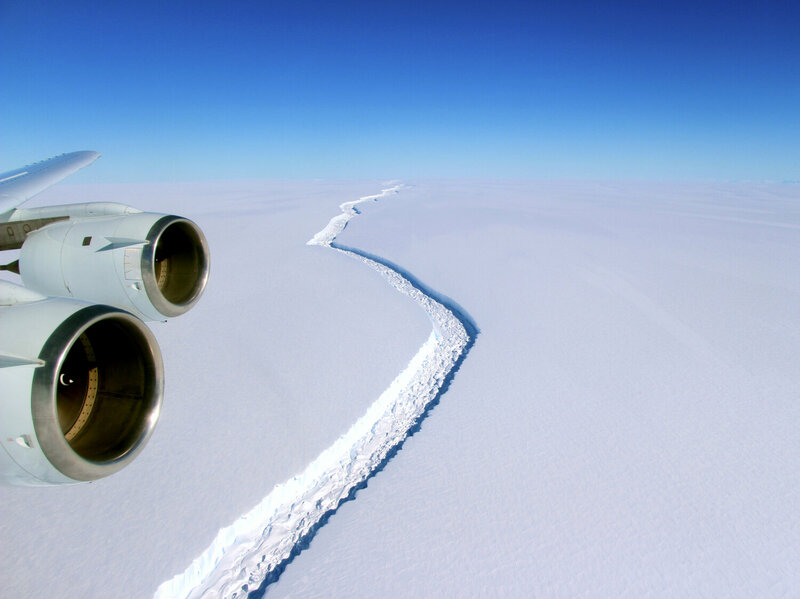 The massive crack first opened up in the Larsen C ice shelf back in 2014; by the end of last week, a roughly 3-mile sliver of ice was all that connected the iceberg to the shelf. As upset as some people might be from news like this, I grow more motivated and inspired by the opportunities to see ice, to paddle around ice, to photograph ice, and to touch the ice that is in my backyard of Valdez and Prince William Sound, Alaska. I do not take places like Columbia Glacier for granted, and I hope that you too, like Rob and Anya, will make the trip to Alaska to paddle around with me in the splendor of ice. Greetings! I’ve been busy the past two weeks with lots of paddling (obviously), including two camping trips. This post is about one of them; another sea kayak camping trip with amazing clients, memories and scenery. Thank you to Evan and Katie, who joined me from Fairbanks for a three-day adventure out on Prince William Sound. Experienced backpackers and campers, these two wanted to get more experience in a sea kayak. We began our trip right from the small boat harbor in Valdez, as Evan and Katie learned how to efficiently pack a sea kayak. We experienced a bit of a headwind for the first couple of hours as we made our way to Shoup Bay. They hung in there and we made it to the Inner Shoup Bay, where a view of Shoup Glacier made our efforts well worth it! We set up camp right in front of the glacier, then hiked up to the face to explore and take a closer look at all the cool features there. Katie had said that all she wanted was to touch the glacier. So, of course, that is what we did! Shoup used to be a tidewater glacier, meaning the face (or terminus) sat in the sea water. The glacier has since retreated onto land again, allowing us the special opportunity to walk around at the face. We found a beautiful cave with a pool of water inside of it, pouring out as a powerful waterfall from underneath the glacier. Making their way up to touch that glacier! Although I am missing the photo (I got distracted and forgot), we dined on salmon with a buttery tarragon sauce that I made, with rice and steamed broccoli. There’s no reason not to eat gourmet out there! With a screen tent to keep bugs and inclement weather out, a table and chairs, I feel as if we’re “glamping” out there. Sipping on cocktails and hot drinks from our comfy camp chairs, watching the glacier and snow-capped mountains, I don’t think any of us felt as if we were “roughin’ it” out there! We stayed up as late as we could (not very), laughing and telling our best adventure stories. Day two we bid farewell to Shoup Glacier and paddled to our next destination, the lovely and serene Sawmill Bay. The coastline from Shoup to Sawmill is one of the prettiest in the port of Valdez, with many cascading waterfalls pouring thousands of feet from the glaciers above. We beat the afternoon winds through the Valdez Narrows and made it into Sawmill Bay earlier than expected, allowing us more time to relax and enjoy a short hike along the clear stream next to our campsite. So cheers to another wonderful sea kayak camping trip in Prince William Sound. Thank you for reading and stay tuned for more exciting blogs from ileneinakayak. The next one (in a few days) will be about the other sea kayak camping trip that I most recently returned from; a five-day adventure from Glacier Island all the way up to the face of Columbia Glacier with two hilarious San Franciscan Brits. You won’t want to miss that one! Here’s a sneak peak of Rob and Anya standing on the mighty Columbia Glacier (a place where not many have stood before), looking south into Columbia Bay. They look pretty happy! SPACE AVAILABLE ON SEA KAYAK CAMPING TRIP IN PRINCE WILLIAM SOUND, ALASKA: SEE COLUMBIA GLACIER FACE! JUNE 26TH – 30TH SPACE STILL AVAILABLE ON A 5-DAY SEA KAYAK CAMPING TRIP. Join me with Anadyr Adventures on this unforgettable adventure as we paddle the rugged coastline of Glacier Island and to the face of Columbia Glacier, the largest tidewater glacier in Prince William Sound, Alaska. Highlights of this new itinerary are what makes this part of Alaska so exceptional and memorable; wildlife, rugged coastline, beautiful beaches with amazing views, sea caves, paddling amongst towering icebergs, remote campsites, and seeing Columbia Glacier up-close. I will cook delicious and nutritious meals for you, as well as provide all of the camping and paddling equipment that you will need to stay comfortable, warm and dry out there. You’ll feel like you’re “glamping” in the Alaskan wilderness! That’s right. . . we’ll bring along a table and chairs! You won’t be roughin’ it too much. This trip is just around the corner, so contact me today for prices and more info! Hello everybody! This blog is about the first camping trip of the season that I had the pleasure of guiding for Anadyr Adventures. Enjoy. What do you do when Alaska throws almost every type of weather at you during a four-day camping trip? Let me tell you. . . You see the beauty in both the driving rain with gusts of wind, and the blue skies dappled with sunshine. You maintain a cheerful attitude, hunker down and discuss the great books you’ve read, eat delicious hot meals, drink a lot of tea, and laugh a lot! A huge thanks goes out to Siobhan (pictured above, leaping for joy for a much-deserved sunny day in Columbia Bay), who travelled all the way from Melbourne, Australia, to join me on a sea kayak adventure. She was everything that a guide wishes for in a client and paddling partner; helpful, cheerful, funny, adventuresome, and with a “ready to rally” attitude. With a less-than-ideal weather forecast for the first day of our trip, we altered the itinerary to include a night at Shoup Glacier, what we called our “bonus glacier”. We endured a bit of rain that day as we paddled to the face of this beautiful blue glacier, then enjoyed a lovely evening as the skies cleared to reveal new snow on the mountaintops. The previous year a young whale had washed ashore in Shoup Bay, which now offers us a unique opportunity to get up-close-and-personal with the carcass of this massive creature. Day two we awoke to blue skies, sunshine, and a gorgeous reflection. Shoup Glacier sure does look pretty with these pleasing conditions. What a gift of a day! We continued on to the magical south side of Glacier Island, where calm seas and light winds allowed us to explore sea caves and enjoy time at the Sea Lion haul-out, where hundreds of these gregarious animals hang out and approach our boat in playful curiosity. We pushed on and made a four-mile crossing from Glacier Island to the south end of Heather Bay, which is right next to Columbia Bay. Tired from an exciting and full day we set up camp and enjoyed the last bit of no precipitation for a little while, as the next day we endured the brunt of a windy rainstorm. Hey, this is coastal Alaska after all! I don’t have any photo evidence from this wet day, however Siobhan and I still rallied, put on lots of warm clothing, stuffed ourselves with hot food and drinks, and set out into the wind and rain to check out the icebergs in Columbia Bay. We paddled up Heather Bay, seeking shelter in Heather Islands’ protected coves. It took a couple of hours, but we finally managed to land on the moraine, which divides Heather and Columbia Bays. This long stretch of land is the deposit of rock, gravel, and sand left over from when this largest of tidewater glaciers in Prince William Sound (tidewater meaning the face of the glacier is sitting in the ocean) had pushed its’ face (or terminus) to this point in the bay. The glacier has since retreated off of the moraine, leaving a great place for walking, as icebergs often ground themselves in the shallows here. We returned to our camp, dried out, filled up with halibut fish tacos, and endured a bit more rainy weather from inside of our dry tents. It’s a great thing we both had good books! Having experienced all of that rain, we were overjoyed to wake up the last morning to clearing skies, which turned into a glorious sunny day. We had the rest of this beautiful day to return to Columbia Bay and paddle amongst the towering icebergs. Siobhan is one of the lucky ones to get to see ice in both grey and sunny skies. There is a unique, dramatic blue to the ice with a grey background. And with sunny skies. . . Well, it’s simply magnificent. We must have repeated a hundred times how lucky we felt for this day. What a trip, filled with so many highlights. I look forward to sharing more camping trip experiences with you, as well as lots of other Alaskan adventures. Thanks for reading and stay tuned for more on the blog. Don’t forget to check out all of the wonderful trip opportunities that Ileneinakayak has to offer. Contact me and I’ll help make your Alaska and Panama dreams come true! Tomorrow I will be preparing for a three-day sea kayaking and camping trip here in Prince William Sound, Alaska. We’ll be paddling in the serene Sawmill Bay and to the beautiful Shoup Glacier. I’m excited to get back out on the water. You can look forward to a blog post about that trip next week. Take care everybody! Happy Memorial Day weekend! I thought I’d share with you some of the pre-season and ongoing training that us kayak guides partake in to keep you safe and knowledgeable out there. The sea kayak season in Valdez, Alaska is picking up as we get excited for June. The other kayak guides have been here for a few weeks already. It’s wonderful to have the anadamily back together again. If you read my last blog you’ll be familiar as to who comprises, and what in tarnation is the anadamily. Spirits are soaring as we settle in to being back amongst the magic of this awe-inspiring corner of Alaska. It can get difficult for a sea kayak guide to be away from icebergs for so many months during the winter, although Palm Trees are not a bad alternative. May has been a month to replenish the lack of Alaska in our lives, as most of the guides were far away during the winter months. May is the time to get back into our sea kayaks and paddle in Port Valdez to test the waters, as we do at the start of every season. We don dry suits, which are full-body waterproof suits, and practice rescuing one another. Yes, that’s right, we willingly plunge ourselves into the cold waters of Prince William Sound to ensure that our kayaking skills improve each season. We hope to not have to utilize these rescue skills during the season (and we rarely do), however it’s good to have them at the ready if necessary. You’re in good hands with this well-trained crew! Another annual training session occurs at the Valdez Glacier. We paddle across the Valdez Glacier Lake and practice our crevasse rescue skills on the glacier. The Valdez Glacier is one of Anadyr Adventures’ most popular day tours and includes paddling around this freshwater lake, alongside massive icebergs. We then take a hike on the glacier to check out all kinds of fascinating ice features, such as crevasses (fissures, or deep clefts, in glacial ice) and moulins (cavities worn in a glacier by surface water falling through a crack in the ice). These are beautiful (and often gorgeous blue) ice features that we get very close to, which makes this tour a favorite of the guides and our guests. It’s a unique opportunity to experience the mysterious and constantly-changing life of a glacier up close. Here we are practicing crevasse rescue on the glacier, another important skill that all Anadyr guides have. Of course, as naturalist sea kayak guides we spend a great deal of time learning about and discussing the natural history of the area, a topic that one could easily spend an entire lifetime studying. This corner of northeast Prince William Sound offers a myriad of habitats, major historical events, flora and fauna, and great Alaskan personalities. From the rush of gold-mining prospectors to the area in 1898, to the major oil spill of the Exxon-Valdez tanker in 1989, to the catastrophic retreat of the Columbia Glacier in the 1980s, and the intricate ways that the natural world interacts in this northern Boreal forest and glacially-carved landscape, there is always more to learn. In the evenings the guides are often gathered together, sharing the diverse things that we’ve seen while on our day tours and camping trips. This keeps us engaged and excited to share this knowledge with our guests. A visit to the wonderful Valdez Museum at the start of each season reminds us how much there is to learn and share. When we don’t have a trip to go on (and it’s a bit wet outside), we still thirst for knowledge. 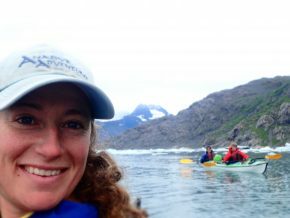 As always, I look forward to taking you out on sea kayaking and glacier hiking adventures in beautiful Valdez, Alaska. Thanks for reading and stay tuned for the next blog, which follows my first camping trip of the season, a four-day kayaking adventure in Prince William Sound, in which we experienced all kinds of Alaskan weather.